Gaming on your smartphone or tablet offers a portable and convenient experience, meaning you can play almost anytime and anywhere, and the trend towards larger displays for devices makes gaming even more pleasurable. Card games, in particular, are one of the best ways to relax and keep you entertained, either for a brief spell in the doctor’s waiting room or on public transport or for longer periods of time when you just want to chill out. Card game apps range from simple, easy games that don’t require much concentration, to more complex games that will require all of your focus and keep your brain ticking over. As well as this they cover genres such as trading card games, casino style, fantasy, and traditional card games, and options to play against opponents or go solo. There are many free apps to suit a variety of tastes and we want to offer something for everyone, so we have endeavored to show you one of the best online card game! 4Down is a new multiplayer online card game that has been released on both iOS and Android platforms. Highly entertaining, 4Down has neat networking features to make you feel the face-to-face experience of a simple card game. 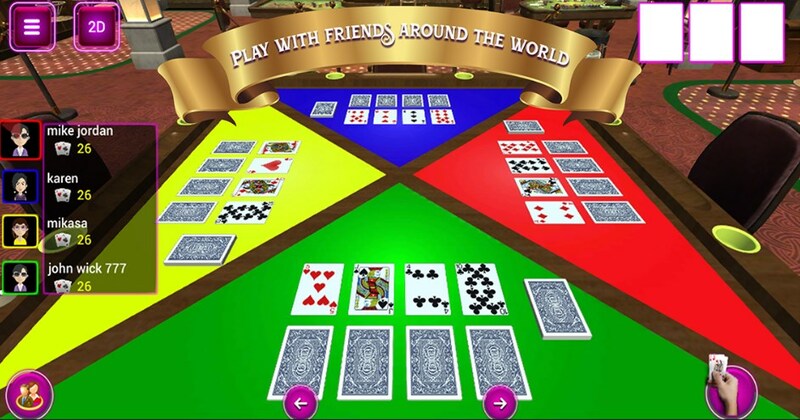 The game starts when each player gets eighteen cards in their hands – eight on the table, four facing down and four facing up. In order to win the game you need to get rid of the cards before anyone else at your table does. You can pick your cards from the table or pick one of those you already have, get access to mystery cards and use the wild cards wisely. Just remember – if you play a higher card that is a foul which means you have to pick up the whole deck of cards. Why do we love a good game? Because of the way it’s made and its’ gameplay, of course. 4Down has amazing HD graphics and allows the player to play cards in 2D or 3D mode – no matter on what device. Winning a round means clearing all the cards and proceeding to play other three rounds in a row. You will be able to join tournaments and challenges, join multiplayer card game tables and compete with other players. You will also be able to follow your scores and compare them with other players on the online leader board. Chat with players or create private rooms for playing and aim for the highest score in order to win this game. Find out if you have what it takes to be the winner – download 4Down now for free.